The player assumes the role of various characters during the single-player campaign, changing perspectives throughout the progression of the story, which, like its predecessors, is divided into three sets of missions called "Acts". Each mission in an act features a series of objectives that are displayed on the heads up display, which marks the direction and distance towards and from such objectives. Damage to the player is shown by the percentage of blood splatter shown on the screen. The player's health regenerates over time. Mission objectives vary in their requirements, ranging from having the player arrive at a particular checkpoint, to eliminating enemies in a specified location, to standing their ground against enemy squadrons, manning mini-guns and other weapons, and planting explosive charges on an enemy installation. Some of these objectives can be failed, and may or may not hinder progression of the story. The player is also accompanied by fellow soldiers who cannot be issued orders. Loved this one the most of all. Awesome story and the multiplayer is so good. Played it so much. Too bad there are hacker on PC. So dunno if it is still worth it. Still one of my favourite COD games. However I'd recommend getting BO2/BO3 for PC because MW3 has almost no players anymore. One of the best in this serie! 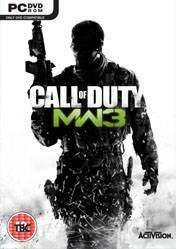 Not the best FPS but surely the best call of duty!